This was a commission for the Shalom Memorial Chapel in RI, requested by Michael Smith, the owner, and his wife Marilyn. Marilyn suggested the kriah theme; that is the ribbon mourners tear and affix to their clothes, rather than rend their real clothes. 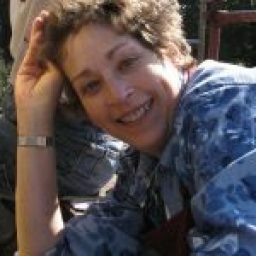 It is worn every day of the 7-day mourning period, except for the Sabbath. 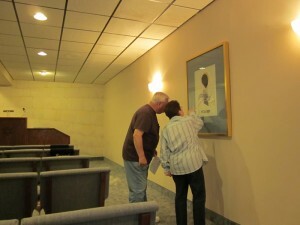 Marilyn also wanted it to work with the original art that was already in the chapel. The dark ribbon is draped with a swirling tallis, with a 23k gold-edged “ataret”, or collar. 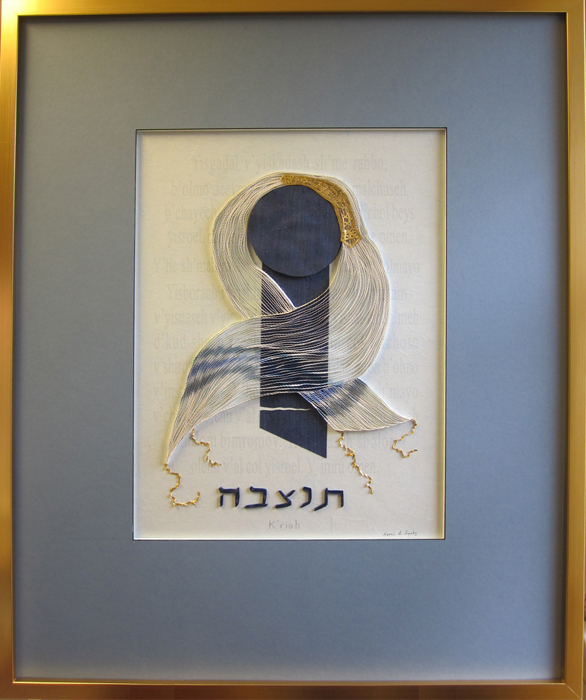 The transliteration of the Kaddish, the “Orphan’s Prayer”, is printed very faintly on the pale blue background. This was the largest piece I have ever made, about 32 x 40. The Smiths were very pleased with the result. This famous quote by the great sage Hillel was a commission from some dear friends. 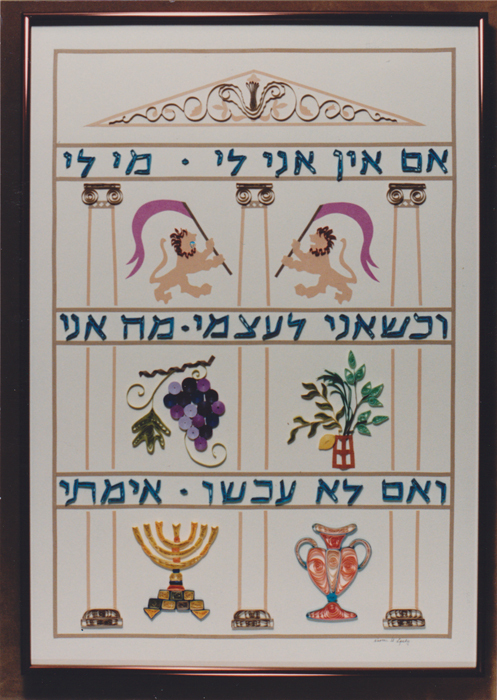 The design is based on the architecture and emblems from coins of Hillel’s time. It is all quilling. A friend of mine liked my “Baruch Haba” (welcome) piece, but wanted a gift for a newlywed Japanese couple, so she brought me the Japanese calligraphy that is the equivalent. 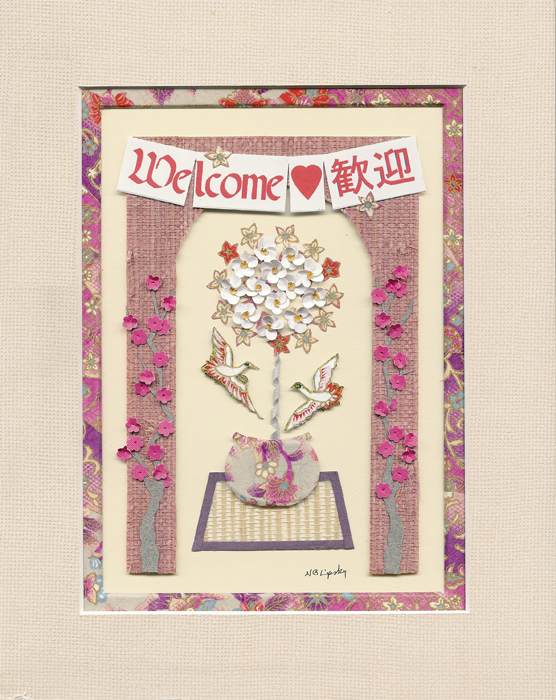 The design is based on some Japanese paper I had, and the flags above evoke the banners I saw over vendors stalls in Japan. 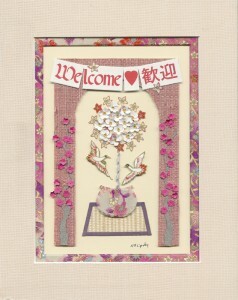 The cranes are lucky, and the chrysanthemum is a familiar Japanese motif. 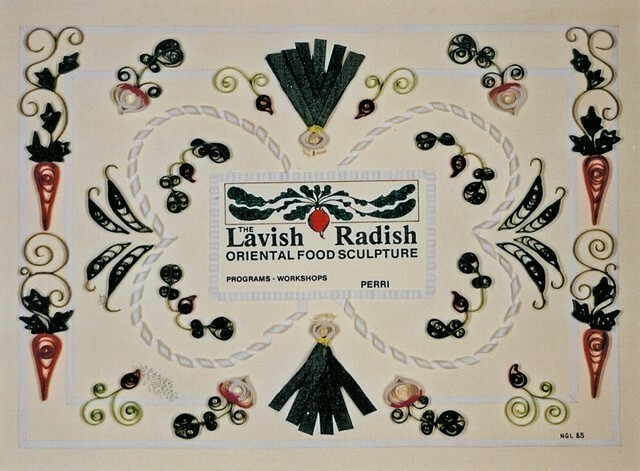 The archway is actually made from Japanese grass cloth, as is the mat under the pot. 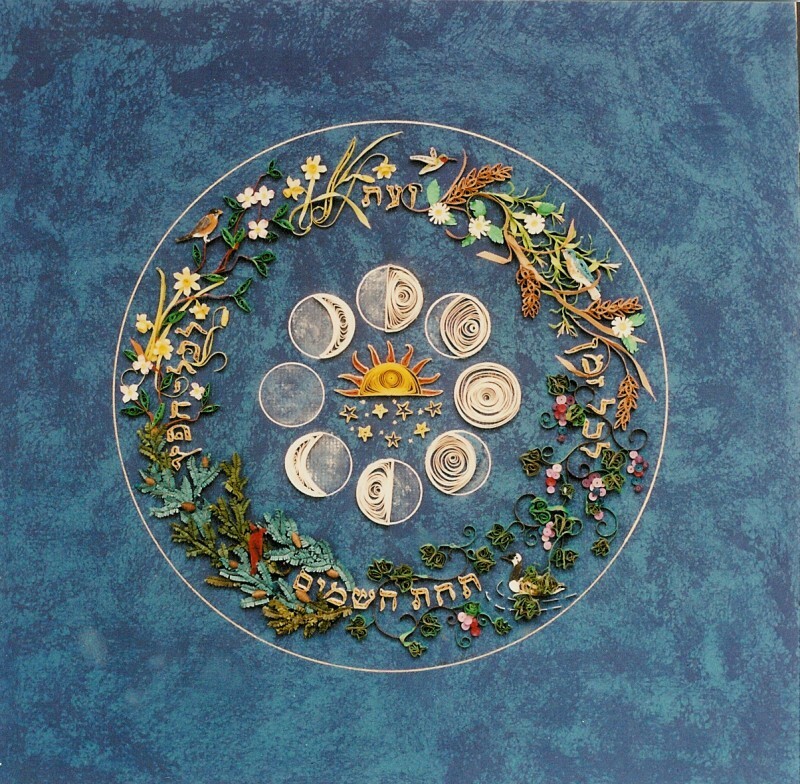 I created this for a patron who wanted something Jewish that would also reflect the natural world. 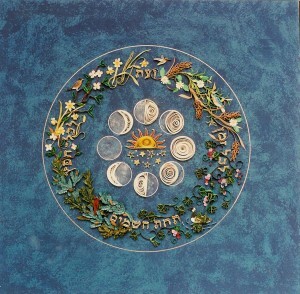 It illustrates the verse “To everything there is a season, and a time to every purpose under heaven”. The center shows the sun and stars, and around them the phases of the moon. The outer circle shows the four seasons, with appropriate flora and fauna. I had just moved to Minnesota at this time, so I included a Canadian “honker”. Everything is made of quilling paper, with some 23k gold edge gilding. The background is sponged gouache on matboard. 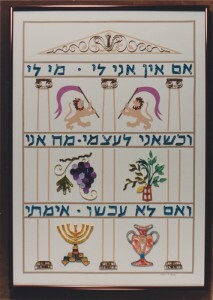 This image was later chosen by the UJA for their 1995 greeting card.